The weather was so bad it sent shivers down my spine. As horizontal rain power-washed the window I had a feeling how the day was going to unfold... another shiver went down my back. Slate-coloured clouds raced across the sky as I gathered my gear together and dashed to my car. I really wanted to shoot a proper winter bass fishing feature here in south-east Ireland and I had hoped for a crisp and bright winter's day. I was thankful some clever designer had developed the waterproof camera bag. I met Graham Hill down on the beach and it struck me how cheerful and positive he was. Not used to blanking on this coastline, the soft Irish weather wasn’t going to dampen his spirits. Clutching a bucket full of prime peelers and some huge lugworms we headed for the angry surf, which boomed as it smashed onto the beach. By now a pounding south-westerly was screaming right into our faces, kicking up monstrous seas that dumped tons of sand-stained seawater on the beach. 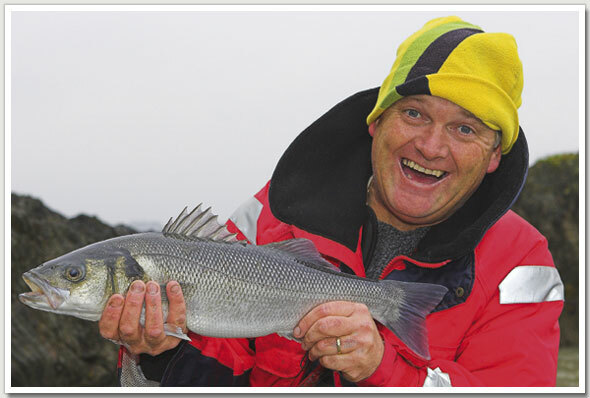 I know bass like to hunt in a lively sea, but surely this was ridiculous? At least Graham was feeling positive. I imagined a hot coffee and bacon sandwich, but with Graham being so positive when faced with such appalling conditions, it did boost my confidence. I so wanted to see a winter bass. 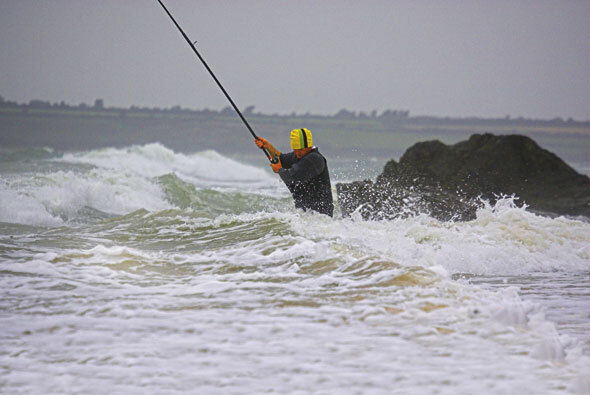 Bass feed all year in Irish waters, but if you want that special big winter fish taken on bait you should head way out west to areas such as the Dingle Peninsula in County Kerry, where sport moves up a gear from late October until early March. Like everywhere, catches are reliant on conditions. Graham reckoned bass were also a 12-month option in the south-east, but he noticed a decline in sport after New Year, up until early March. It can’t be that bad though, because he told me he’d seen bass caught on plugs on New Year’s Eve. The severe gale meant this was the time to anchor juicy baits hard to the bottom with a decent grip weight and try to ride out the conditions until the bass found our humble offerings. Graham launched a fixed-paternoster rig out into that likely-looking hole, but I wondered if the fish would dart about seeking food in conditions that must have been like a washing machine. This is what many bass anglers dream about - big booming rollers topped by white crests and the expectation of a bass. If we could control the weather it would be far too easy, wouldn’t it? High-tech waterproofs and chest waders were designed for times like this. The fact that we could hardly see due to the horizontal rain mattered not; it was those tell-tale taps and bangs on the rod tip that had us grinning like madman as the rainwater poured off our faces. Nobody was out walking their dog today, so we weren’t getting those weird looks from people who think anglers standing knee deep in freezing water are nutters. Little do they realise that the angler is an eternal optimist and if our dreams and hopes could be bottled it would be priceless. Ten minutes into the fishing and Graham was shaking his head. Conditions looked good because there was a stunning swell that was effectively being calmed by the sandbank, giving the bass a gutter to hunt in and stay out of the worst of the sea. Yet Graham was struggling to pull in great rafts of weed that had broken his gripper out and washed it along the beach. Fishing effectively was out of the question. Perhaps that bacon sarnie wasn’t just a dream. Despite the conditions, Graham was still smiling. Could anything dampen this guy’s enthusiasm for bass fishing? I like to hear of decent options if primary plans don’t work out and the chance to shelter from the relentless weather would be most welcome. I was wondering if our little detour would take us past the café I had seen earlier. Twenty minutes later we were negotiating a slippery bank to the rocks below. One rod each, minimum tackle, a bucket of prime bait and a dream of bagging a bass were all we had. The moment we negotiated the steep bank it was like a different world. Around the corner to our right the weather was a ripping storm that sent great swell surges crashing into the coastline that we could just make out in the distance. Here in our little hideaway it all looked perfect. There were even a couple of seals working the area, something I knew Graham liked to see. Baits were aimed where Graham knew the sand began at the edge of some very rough ground. Grippers were wrenched round in the surge, but eventually they found a decent resting place and our peeler crabs started to fish properly. Meanwhile I couldn’t resist clambering around the corner on some extremely slippery rocks to see what was to our left. Why do rock anglers always have the urge to look for the next corner, the next headland, perhaps the next mark? I paid the price for pushing my luck and finally returned to my rod with a deep cut in my left hand. Like an idiot I had slipped and grabbed some shark-tooth rocks to stop myself falling in the sea. As I bound my bloody hand with a wet fishing rag I thought this might be a lesson learnt. As I looked up from nursing my wound I saw Graham whack his rod back in response to a savage, slap-down type of bite. The unseen fish careered round to the right, but steady pressure from Graham soon brought a bass to his waiting hands. Does this coastline ever let him down? I have yet to see County Wexford fail to deliver the goods and that's why I keep banging on about it having the best bass fishing in Ireland. Bear in mind the horrendous conditions that we faced; anywhere can fish well when everything is right, but how do they perform when conditions are terrible. Despite my injury I managed to catch a fish, maybe nudging 41⁄2lb. It was a moment of joy, its fins bristled, it was well fed, powerful and eager to run from my hands when I crouched down to release it. It was getting to the point when the ebbing tide was going to make fishing the mark impossible. With our lines starting to rest across a rocky hell in front of us, Graham got another bite and set the hooks. He kept the pressure on and got it over the rocks to bring it to hand. Graham smiled, the camera shutter clicked and the bass went back. Surely it can’t get any better?